Thanks to Matt Bedin, BI EE product managment and Thomas Lukens for sharing this. 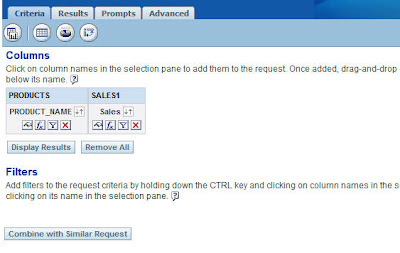 One of the important requirements for any user is to have multiple formatting options within a Tabular View table. 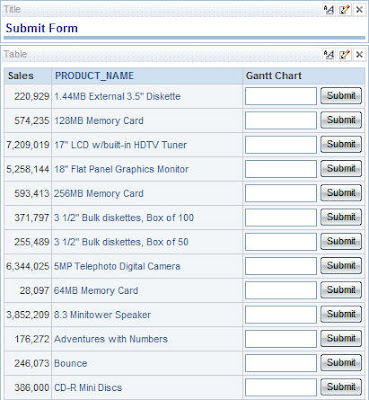 For example, one might need scrolling Marquee within a column i.e make a column value move from left to right or one might want to display images from a site or one might want to even put submit forms directing to an external application and last not the least to display Gantt like charts within a tabular column. So, lets look at enabling each one of the above one by one. Lets start with creating a sample report. 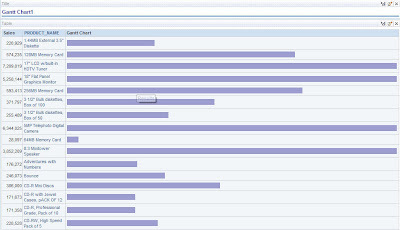 Lets create a report with Product Names and the their corresponding Sales. Our aim is to make the Product names rotate like a Marquee. 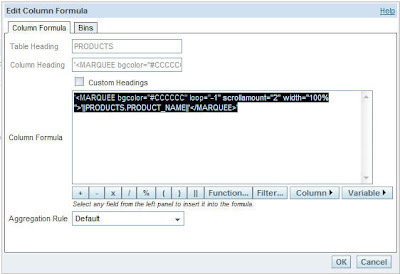 Now go to the formula window of the Product Names and enter the below HTML text. 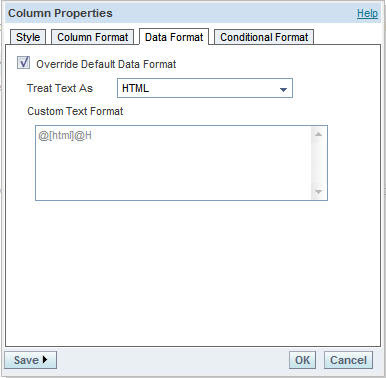 Now go to the Properties of this columns and navigate to Data Format and change the data format to HTML. Now if you look at the report the product names would be scrolling. Now you can realize the kind of extensibility this can have. You can have your own HTML formatted columns. All the remaining 2 that we would be seeing are actually extensions of this property. And change the column format to HTML as above. Now change the data format to HTML. Here, we are basically creating a horizontal bar whose size varies according to SALES1.Sales column. We have divided by 100 in order to bring the size relevant to HTML format. One can use this to have multiple other formatting options. If you are good in HTML then this is just for you. This entry was posted on December 6, 2007 at 2:02 pm	and is filed under All Posts, OBI EE Plus. You can follow any responses to this entry through the RSS 2.0 feed. You can leave a response, or trackback from your own site. After upgrading to oracle BI, I realised that I had to set the HardenXSS setting to false in the instanceconfig.xml to be able to do html tags like these. Thanks for the posting Venkatakrishnan, I’ve found your blog very interesting and useful. Keep up the good work! Remember to use your corresponding column name within the HTML. The one shown above is an example showing making the Products column to rotate. very interesting features within BI. Specias characters are a problem for novice users. Good work! please keep it up. i set the HTML also………. One question: the images I have to use for a customer are quite large, and it’s not possible to reduce their size or the image details will be lost. Is it possible to set up a behavior similar to ‘Action Link’ so that if the user wants to see a particular image and clicks on the action link icon, the image will appear on a separate, larger window? If I’m storing the images in the database as a blob column, is there a way to display them in Answers? Would I be better off storing the URL of the image and using the technique? 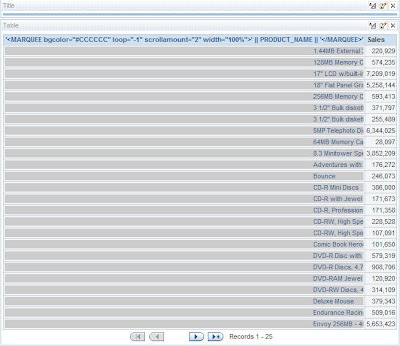 Never mind, found it on your site at https://oraclebizint.wordpress.com/2007/12/10/oracle-bi-ee-101332-displaying-blob-images-using-plsql-gateway/.